In a previous posting I demonstrated how you can create a powerful display of grouped data using the GridView, which is typically used to fill the screen. Every Windows 8 application must also support SnapView, however, in which your application is allocated 320×768 pixels – that is, your application is squeezed into a relatively thin sliver on the left or right of the screen. GridView leaves much to be desired in SnapView and the common solution is to hide your GridView and to display the same data in a ListView, which works well in those dimensions as it scrolls vertically. 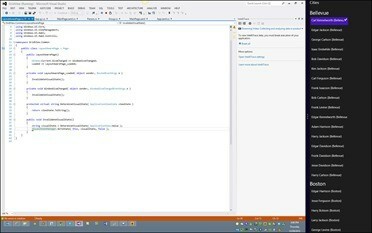 In the image to the right (click on the image to expand), Visual Studio is shown in the Fill state and our application is shown in the SnapView. In the SnapView we display the data in a ListView and we make the title smaller. 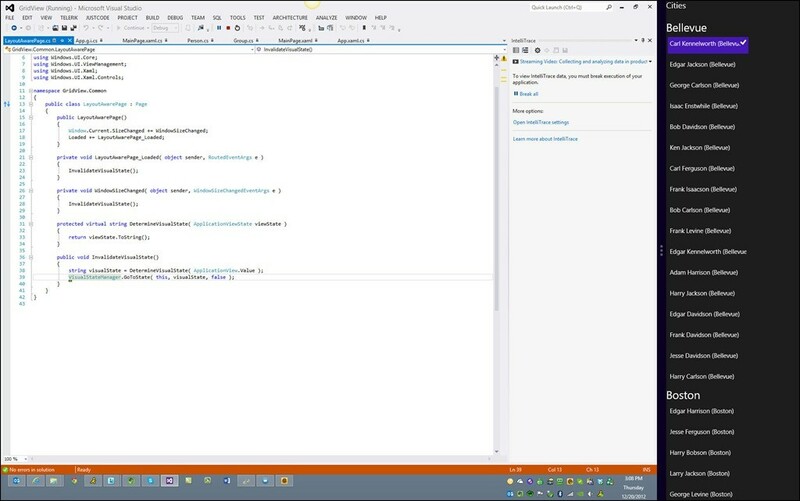 To get started, create a new Blank App application. Recreate the previous application, or download the previous application here. At this point you should have an application that displays a GridView. Put that application into snapped view (Windows – dot) and notice that what you get is a thin slice of a GridView. The GridView itself is unchanged. Run the application and notice that your GridView scrolls underneath the title, which is just what we want. When we are in SnappedView we want to display this same data in a ListView. Since ListView and GridView share all the same methods, events and properties, you can copy and paste the GridView so that you have two, one above the other. Change the second GridView to a ListView and fix up anyplace in that ListView that says GridView (e.g., change the ItemContainerStyle TargetType from GridViewItem to ListViewItem). Name the GridView FullView and name the ListView SnappedView (this is arbitrary and you can name them anything you want as long as you match up the names with the storyboard targets). Notice that it is nearly identical to the GridView and that, most important, its ItemsSource is bound to the same CollectionViewSource as the GridView. This is very important as it will enable both controls to point to the same data. In fact, by using the CollectionViewSource, if we select an item in the GridView and then switch to SnapView, the same item will be selected. They must have these names. The first three will be empty but the fourth, Snapped, will have a Storyboard to implement the changes you want to have occur when you move into Snapped view. All of these changes happen, essentially, instantaneously. We’re all set, when the view state changes to snapped we’ll diminish the size of the title and we’ll hide the GridView and show the ListView. When we move out of SnappedView we’ll return to the default settings (since there is no storyboard for those states). But how do we get the view state to change? The job of SetVisualState is to obtain the current visual state and to ask the VisualStateManager to go to the state with that name. This forces the change in ViewState that is picked up by the page. When you switch from Full View to Snapped View the WindowSizeChanged event registered in LayoutAwarePage, fires. This causes a call to SetVisualState which in turn causes a call to the Visual StateManager’s GoToState method, passing in the new viewValue. 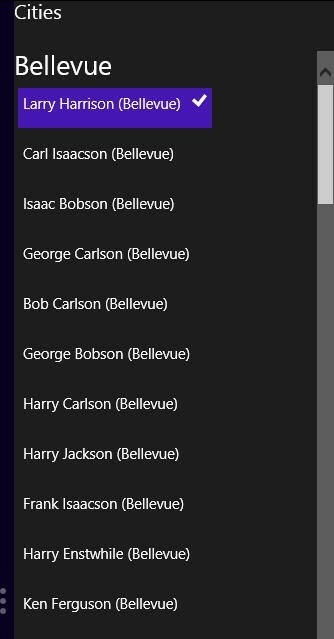 This in turn starts up the animation defined in MainPage.xaml causing the font size of the title to shrink and the GridView to be hidden and the ListView to be shown. This entry was posted in Data, Mini-Tutorial, Styles and Templates, Windows 8 and tagged Mini-Tutorial. Bookmark the permalink. Thank you Jesse! This is the clearest example I have seen to date of how to do this without resorting to the “use the template and remove what you don’t need” approach.